Thanks to Opera Atelier, Toronto is one of the few cities in the world to see French baroque opera on a regular basis. OA first presented Persée, the extravagant 1682 opera by Jean-Baptiste Lully (1632-87), as its millennium project in 2000. The success of this production led to a revival in 2004. OA has now revived the work again because it has received the extraordinary honour of being asked to take the production to Versailles, where it was last performed in 1770 to open the new Opéra Royal as part of the wedding celebrations for the future Louis XVI and Marie Antoinette. OA has integrated song and dance in a way that no other company can to produce a glorious work that balances stunning spectacle with insight into human emotion. of his enemies at court. Yet, though Persée (Christopher Enns) may be the title character, most of Philippe Quinault’s libretto concerns the emotions of those at court. Cassiope (Carla Huhtanen) is filled with remorse and shame before everyone, especially her husband Céphée (Olivier LaQuerre) since it was her boast that she was more beautiful than Juno that brought the plague of the Medusa to Aethiopia, the land he rules. The emotional centre of the work, however, is the noblewoman Mérope (Peggy Kriha Dye), a character Quinault added to the story. From the beginning of the action she is hopeless in love with Persée, who in turn loves Céphée’s daughter Andromède (Mireille Asselin). Céphée has made the lovers unhappy by having promised that Andromède will marry his brother Phinée (Vasil Garvanliev). In a further complication, when asked what he wishes in return for ridding the land of the Medusa, Persée asks for the hand of Andromède, a favour Céphée has no choice but to grant. This act leaves both Phinée and Mérope as people thwarted in love, but they represent a study in contrasts. While Phinée is consumed with rage and plots revenge against Persée, Mérope suffers alone and in the absence of Persée even bonds with her rival Andromède since they both care for him and fear what may happen. In 2004 Persée was already one of OA’s most lavish productions, but the invitation to Versailles has caused the company to increase its opulence even more. Set designer Gerard Gauci’s designs, inspired by the original 1682 designs of Jean Bérain, has completed his vision of the work with additional forced perspective backdrops for the audience hall of Céphée, a grotto for Méduse and a stormy seascape where the monster Céto lurks for his prey Andromède. Dora Rust-D’Eye’s costumes were already sumptuous, but Michael Legouffe’s additional costumes allow for more costume changes to suit the varying moods of the work. The only cast member from 2004 to return in a major role is bass-baritone Olivier LaQuerre, who again sings both the Aethopian king Céphée and the bearded, snake-haired Méduse, who justly laments her loss of beauty. LaQuerre’s voice is still as warm and velvety as before but seems to have lost some of its power since it does not always ride over the orchestra sound as do the other voices. His characterization of Méduse, however, a role originally written for a tenor, is as amusing as ever – much more a petulant drag queen than a fearsome beast. Vocally, the star of the evening is Peggy Kriha Dye as Mérope. Her lovely soprano has an attractively dark shade to it that perfectly suits a character in a perpetual state of mourning her unrequited love. Kriha Dye’s natural expressiveness makes Mérope the one character for whom we feel the greatest sympathy and her private sadness is central in providing a necessary counterpoise to all the celebratory and fantasy scenes of the opera. As Andromède, Mireille Asselin has bright sparkling soprano and a graceful sense of line. 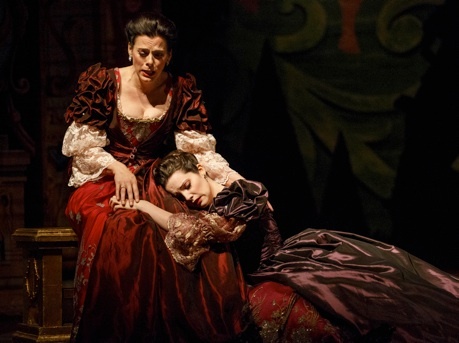 One of the musical and emotional high-points in the opera her duet with Kriha Dye in Act 2, scene 5, when Mérope sets aside her jealousy to share Andromède’s fear for the adventures Persée is to undertake. The blending of Asselin’s and Kriha Dye’s voices is heavenly as is their characters’ sad recognition that they both love the same person. The always dependable Carla Huhtanen gives a more complex interpretation of Cassiope than usual as a woman whose inherent pride struggles to reassert itself after the shame it has brought on her. Pynkoski announced that tenor Lawrence Wiliford would perform as Mércure despite a cold, but, in fact, he has never sounded better and perhaps should cultivate the added resonance that helped lend his voice such richness. 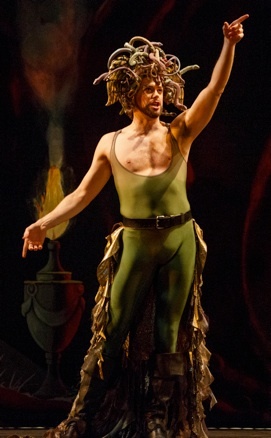 The two disappointments in the cast are Christopher Enns in the title role as Vasil Garvanliev as Phinée. Persée marks Enns’ debut with OA and his debut as an haute-contre. Yet, unlike Cyril Auvity, who sang the role in 2004, Enns attains the sweet, very high tenor sound of an haute-contre only in duet with Mireille Asselin when he sings at a lower volume. At a higher volume he sounds like an ordinary tenor with a metallic tone that increased with his volume. Enns, unlike the rest of the cast, has not yet mastered graceful Baroque movement or the desired S-curve posture in standing. Garvanliev, in contrast, stands out in adopting Baroque posture and gesture with such vehemence that they are no longer graceful. Unlike Alain Coulombe in 2004, Garvanliev does not give Phinée’s ongoing rage the variety it needs and in singing he indulges in far too many unmusical shouts and exclamations in a counterproductive effort to increase the drama of his performance. As before the choreography of Jeannette Lajeunesse Zingg is integrated perfectly into the action which here encompasses sword-fighting and anvil strokes. Conductor David Fallis led the 30-member Tafelmusik Baroque Orchestra that boasted two continuos, placed to the extreme right and left of the pit. The orchestra produces a sound that is simply gorgeous and incredibly rich, yet capable of rhythms that are admirably fleet and nimble. The contributions of the Tafelmusik Chamber Choir are impeccable. Persée has wowed Toronto audiences on three separate occasions. It is sure to wow the French in Versailles. One can’t fully express the pride we Torontonians feel in Opera Atelier’s international success. It is richly deserved. The performances at Versailles are May 23 to 25. We send them our best wishes for a safe journey and triumphant sojourn. Photos: (from top) Olivier Laquerre (far left) Cephée), Mireille Asselin as Andromède, Christopher Enns as Persée and Artists of Atelier Ballet; Olivier Laquerre as Méduse; Peggy Kriha Dye as Mérope and Mireille Asselin. ©2014 Bruce Zinger.